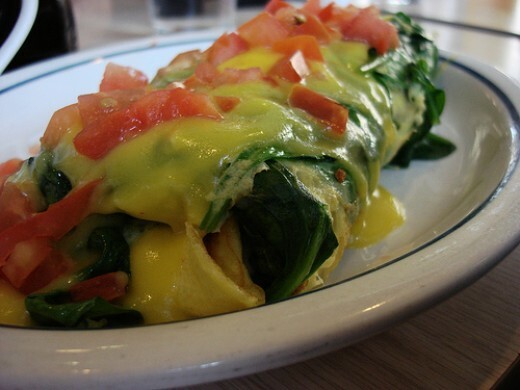 This spinach and mushroom omelette served at International House of Pancakes IHOP contains fresh spinach, mushrooms, onions and Swiss cheese and is topped with hollandaise sauce and diced tomatoes. Read on to learn how to make this restaurant copycat recipe at home. Add spinach, mushrooms and onions. Saute until the spinach leaves start to wilt. Set aside and drain liquid. Mix in water, salt and pepper. Pour eggs into a greased skillet. Cook until the eggs set. Add spinach, onions, mushrooms and cheese. Top with Hollandaise sauce and diced tomatoes.